Mercedes-Benz has unveiled the latest piece in its SUV jigsaw - the GLC. Nothing to do with Welsh rap acts, the GLC is a compact SUV similar in size to a BMW X3 and Audi Q5. Prices start at £34,950 and it goes on sale in the UK in October. Mercedes-Benz is surprisingly late to the compact SUV party, given how extremely popular they are, although it did previously have the boxy GLK which was sold in mainland Europe but not the UK. However, the GLC is a very different offering. As you can see from our pictures, it follows the design of the latest C-Class - no surprise given that it uses that model as its base. But it's more than just a jacked up version of the C-Class - the GLC has enough to differentiate itself. The smooth lines work well and it doesn't look or feel like a traditional big SUV. We sat in the back where there's plenty of leg and headroom - even more so than the C-Class Estate. The boot is generous and includes an extra underfloor storage compartment plus all models come with an electric tailgate as standard. However, like the C-Class there's no room for a spare wheel. In the front you'll find the usual excellent Mercedes-Benz build quality and attention to detail. The finish on the dash along with the seats is impeccable and echoing the C-Class, it's elegant yet modern with a large iPad-esque screen dominating the central stack. Just two models will be available from launch - the GLC 220d 4Matic and the GLC 250d 4Matic - the latter costing an extra £1155. Both are powered by the same 2.1-litre four-cylinder engine with the 220d developing 170PS and 400Nm of torque. A nine-speed 9G-Tronic automatic gearbox comes as standard. The 250d has power boosted to 204PS along with extra torque of 500Nm yet both return the same claimed 56.5mpg while very reasonable emissions of 129g/km put it in VED band D - currently £110 a year - and will make this a very attractive choice as a company car. Next summer we'll get the GLC 350h plug-in hybrid model which emits just 60g/km of CO2 yet still provides 320PS. There will also be two AMG models - a GLC 450 AMG and a top of the range GLC 63 AMG. However there are no plans for two-wheel drive models or an entry-level GLC 200d version. Three trim levels are available - SE, Sport and AMG Line - with all cars getting an automatic tailgate, reversing camera, privacy glass, heated windscreen wash system and DAB radio. As its a 4matic, the GLC comes with Dynamic Select which has various different off-road settings such as incline, slippery and trailer assist. There's even a setting which will automaticaly rock the car back and forth if it gets stuck. An optional Off-Road Package is available which includes a reduction gear, higher ride heights and an inter-axle differential lock. 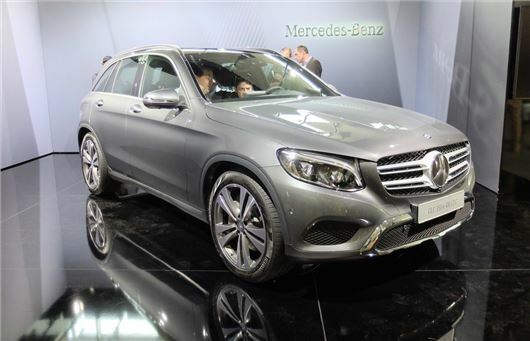 The launch of the GLC coincides with Mercedes-Benz overhauling its SUV line-up. The M-Class has been renamed the GLE and there will be a GLE Coupe coming as an alternative to the BMW X6. The even larger GL-Class is now called the GLS. The way Mercedes-Benz names its engines has also been massively simplified with all diesels now badged 'd' while hybrids will come with an 'h' and electric cars with an 'e'. If you drive a petrol there's no extra letter.